French Bank Document from the Banque Foncière de la Noblesse issued in 1920. 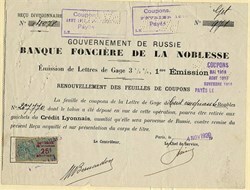 This historic document was relates to Russian Bonds issued in 1913. This item has been hand signed and is over 92 years old. Tax stamp attached to document.